Experienced international travels are almost certainly already familiar with visas. These essential documents facilitate most cross-border travel, but visa requirements vary according to one’s destination. American citizens who are intending to visit India will require a visa – along with a United States passport – in order to enter the country. Indian Visas can be acquired overseas from Indian missions and posts. There is also an online route to applying for an Indian visa. Many US citizens who decide to visit the gorgeous and diverse land of India start their planning process on the internet. The Indian government issues visas in a range of different formats. These are mostly divided according to the traveler’s purpose in coming to India; examples include research, transit, journalism, business, employment, emergencies, conferences, diplomatic travel, medical travel, and studying. If your own purpose for visiting India is simply a vacation, the most suitable sort of visa may be the E-tourist Visa (eTV) which you can apply for online. 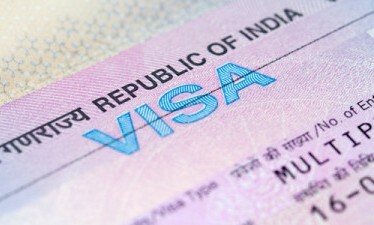 While the application process for many forms of Indian visa starts online, it usually ends at an Indian mission or port. Visa applications will require at least three days to process before a visa can be issued. This schedule can be accelerated, but only in very specific and specialized circumstances. You can also initiate the visa application process by visiting your nearest Indian consulate or embassy. Be aware, though, that the necessary forms cannot be filled out by hand. The fastest way to complete your application is to download the forms from the website of the Indian government and fill them out before visiting an embassy, consulate, or Visa Application Center. All of the required supporting documents that go along with your application need to be submitted in advance. Examples include passports, national identification cards, birth certificates, and other official documents. All of the information needs to be correct and truthful; take the time to verify your information before submitting it. You can save documents online at the Visa website for attachment to a later application if this is more convenient for you. Keep in mind that every individual entering India needs to apply for Indian e Visa separately. If you’re traveling in a group or being sent to India by a larger organization (e.g. a major corporation), make sure applications are filled out for every member of your party. Once you have completed the application, submitted the documents required, and paid the necessary fees, the online system will provide you with an application ID. You can also set a date and time for your interview appointment once this process is complete. Visiting an Indian consulate or embassy is a viable route to starting the visa application process, but the forms cannot be completed “in person.” This is because the Indian Visa Application Centers do not accept hand-written information. The faster way to get the process started is to download the necessary forms from the Indian government’s website. If there is not a Visa Application Center near you, note that you can also turn in your application at any Indian mission or port. The primary requirement for receiving an Indian Visa is a fully filled-out application form. You will also need to provide supporting documents as noted on the application. Once you have gathered the necessary materials and completed the document, it can be delivered to your nearest Indian Visa Application Center.